Hmmm. No links to anything to prove such a sweeping statement. And is Green Bay the only place to fish for whitefish on ice? “Now we’ve got this big recreational fishery that is unprecedented and unmatched anywhere else on Lake Michigan. We’re talking about the whitefish ice fishing. The guided trip fishery has become a major entity,” said Scott Hansen, a Department of Natural Resources fisheries biologist. Fishing guide Lonney Goman puts it another way. Goman was one of the first guides to take advantage of the winter whitefish boom on the Bay of Green Bay. 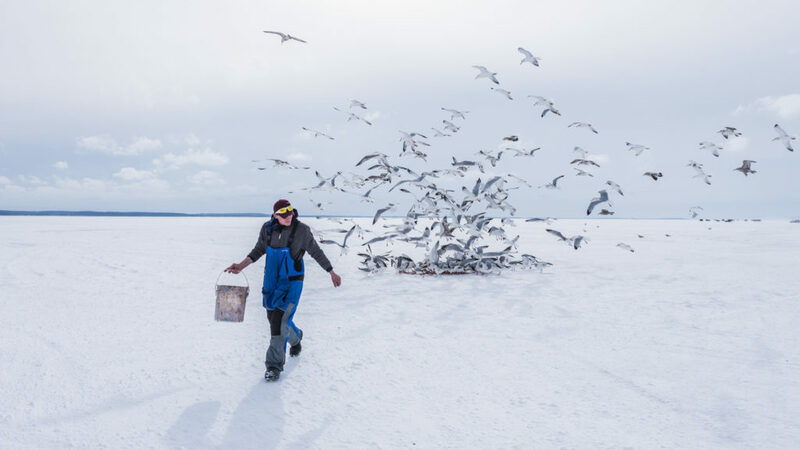 Gulls gather in anticipation as Trophy Ice Fishing employee Eli Hanks prepares to dump a bucket of fish guts on the ice. Photo by Len Villano. Goman and his wife, Barbara, operate Green Bay Trophy Fishing until the bay freezes and they become Trophy Ice Fishing. On February 18, 2016 — a cold and very windy day — Jim Mecklenburg and Alan Graves were proving Goman’s point, comfortably ensconced in one of Goman’s shanties — or ice houses, as he calls them. A small village of shanties was erected almost three miles out on Sturgeon Bay, including one used exclusively by Goman’s staff, who efficiently cleaned all the whitefish being caught and, on top of that bloody task, cooked up a delicious fresh shore lunch of deep-fried whitefish for the customers. “This is our second year in a row,” said Graves, of Greenfield, Wisconsin. “Jim found Lonney online. The rest is history,” Graves said. He mentions that his wife is an avid angler. Whitefish feed on the bottom, so the anglers were jigging 94 feet of line to the bottom. When you consider that they were fishing in water that deep, with only 14 inches or so of ice separating them from that cold water, who could blame her? But once you’re out there, it’s easy to forget you’re on a massive sheet of ice, especially when you are concentrating on getting your 10-whitefish limit. “If ice can be safe, this looks like really safe ice,” Mecklenburg said. Alan Graves (left) helps his fishing partner Jim Mecklenburg land a whitefish. Photo by Len Villano. Mecklenburg said that’s easier said than done. Which comes back to the reason why these two guys and scores like them come from all over to dress for Antarctica and spend an entire day fishing on ice. This was the second of their two-day fishing trip, and they had gone for the full ice fishing experience. 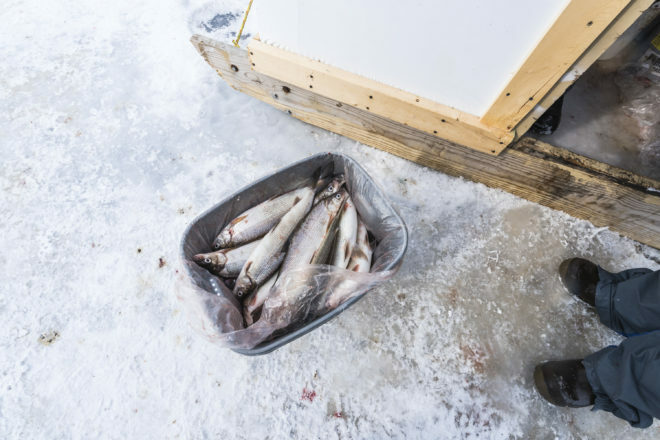 Goman offers a package that includes fishing on the ice for walleye and whitefish, the walleye experience taking place early in the morning, followed by whitefish jigging from 9:30-ish am to 3:30-ish pm, and then returning for more walleye until dusk. He added that this winter fishing expedition was a special one. “I’ll be moving to Georgia in the spring so won’t be able to do this much,” he said wistfully. We hope he got his walleye. More importantly, the winter whitefish boom provides the visitor bureau with another marketing tool for the county. 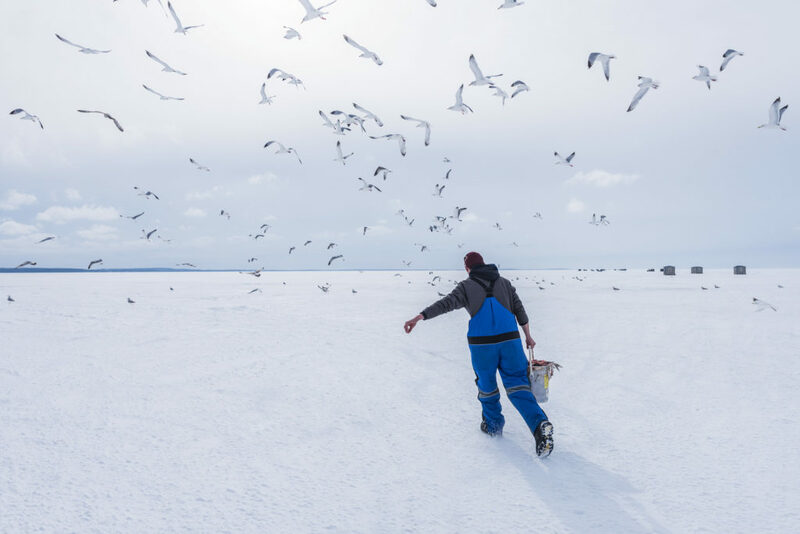 Gulls gather after Trophy Ice Fishing employee Eli Hanks dumps a bucket of fish guts on the ice. Photo by Len Villano. Jarosh is also in charge of providing opportunities to travel writers to participate in Door County activities. Lonney Goman said there were a lot of bumps in the road for he and his wife as they established their winter ice fishing business. Important to the couple in building their business, they want to keep prices reasonable. Lonney and Barbara Goman of Trophy Ice Fishing. Submitted photo. They have also developed some weekend packages, beginning with Whitefish Weekend on February 17 – 19, which begins with a fishing seminar at Sherwood Point Grill and then two days of fishing, a fish fry on the ice and two nights lodging for $265 per person. The weekend after that is Women’s Weekend, featuring Barb Carey, founder of Wisconsin Women Fish. This weekend, too, begins with a fishing seminar. With close to 20 shanties, six UTVs and a half-dozen employees, Goman said his business is just about the right size. “Bigger isn’t always better. We could expand, but we don’t want to lose our customer service, that personal touch,” he said. Goman also has faith that winter whitefish is a long-term proposition.